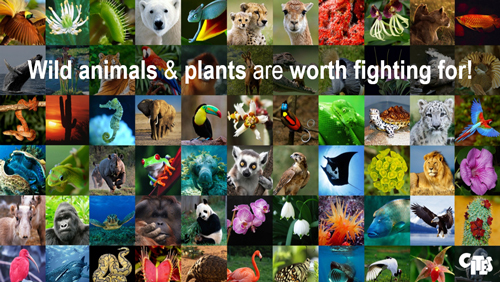 We share our planet with millions of species of wild animals and plants. They keep us alive through making fresh air, clean water and healthy soils, they are used every day to make medicine, food and furniture and they support cultural, recreational and tourism pursuits. While wildlife keeps all of us alive its future is squarely in our hands. We alone will determine the fate of the world’s wildlife and in doing so our own destiny. You may not know it but each one of you here today has a critical role to play in ensuring the survival of our wildlife. You are in the front line of this fight and shortly I will outline what you can do – but I first need to set the scene. Wildlife based tourism can take many forms. It includes enjoying wild animals and plants on the land, in the air and below the surface of the water – and these images of beautiful wild animals and plants, both large and small, should help remind us why wildlife is worth fighting for in this very special year – the UN International Year of Sustainable Tourism for Development. You know the facts and figures on tourism and wildlife based tourism. You know it occupies a particular niche, that it is a growing sector across all regions and that it generates jobs, including in areas remote from capitals. Yet the very assets that underpin wildlife based tourism – the wildlife itself – are under severe threat. These threats include habitat loss, pollution, infrastructure, climate change, over exploitation and illegal trade. We must tackle these threats if wildlife is to survive, if wildlife based tourism is to survive, if your own business is to survive! In the time available I will focus on one of these threats – which poses a grave and the most immediate threat to wildlife– and that is from illegal trade, which is a threat you can do something about. Over recent years we have experienced a surge in illegal wildlife trade, it is industrial in scale and is being driven by transnational organized criminals who are targeting high value wildlife. The UN World Wildlife Crime Report shows that over 7,000 species of animals and plants from across all regions are impacted – and this illegal trade is estimated today to be worth up to 20 billion dollars annually, ranking it amongst other serious crimes such as illicit trafficking in narcotics and people. It is why it is captured in Goal 15.7 of the Sustainable Development Goals. The poaching of African elephants and the illegal trade in their ivory is one of the most noticeable and destructive forms of wildlife crime. Over just three years (2010-2012), an estimated 100,000 elephants were poached for their ivory. In some regions, such as Central Africa, the scale of the killings is putting regional populations at imminent risk of extinction. The poaching of the rhino in Africa was well under control up until 2006 when only 60 animals were poached Africa wide. Since that time we have seen a rapidly increasing level of poaching, which now exceeds 1,300 animals illegally killed each year across the continent for their horn. Just 30 vaquita, a small porpoise, and the world’s most endangered cetacean. There are more people sitting in this room today than there are Mountain gorillas, Javan and Sumatran rhino and vaquita left on the entire planet. I could go on but I think you get the picture – we are confronting a crisis and if we do not act immediately these magnificent animals will be lost on our watch. And the impact of this illegal trade is not just on wildlife, it also poses a grave threat to people and their livelihoods – as well as national economies and in some cases local, national and regional security. Brave rangers serving in the front lines are being killed and injured in the line of duty, officials are being corrupted, and local communities are being deprived of making their own development choices. Magnificent wildlife destinations are being plundered by poachers for the illicit trade, including UNESCO World Heritage Sites across Africa, such as the Selous Reserve in United Republic of Tanzania – which has been included on the World Heritage ‘in danger’ list due to the high levels of poaching along with another 13 sites across Africa. These transport networks allow wildlife products to reach the four corners of the earth, whether legally or illegally. And unfortunately, these legitimate forms of transport are being exploited by transnational organized criminals and others to transport their contraband. The good news is that there is a strong global collective effort underway to combat this illegal trade involving the UN, international bodies like INTERPOL, the World Bank and the World Customs Organization, philanthropists, the non-government and the private sectors. International cooperation to combat these serious crimes is at an all-time high and we are making some good progress, including here in Thailand, but much remains to be done. As an example of our cooperation with the private sector, leaders of airlines, cruise line operators, shipping lines and courier companies are all part of a Transport Task Force established by The Royal Foundation, under the patronage of HRH the Duke of Cambridge and chaired by Lord William Hague – a distinguished former UK Foreign Secretary, to address how the transport sector can assist in combatting illegal trade in wildlife. A Declaration, called the Buckingham Palace Declaration, has now been agreed and signed off by over 50 transport organizations, which commits them to specific actions. Sir Tim Clark of Emirates Airlines has attended every meeting of this Task Force. He signed the Declaration, has educated his staff and raised awareness amongst his passengers. He has even painted some of the Emirates airline fleet with wildlife, which looks fantastic. He has led by example. And while this has all come at a price, I am sure that the costs have been outweighed by the benefits. Actively promote responsible wildlife based tourism – tell people who love wildlife not just tweet about it but to get out and experience it! Most importantly, to invest locally. It is perhaps this last request that is most important. When you look to establish or acquire a wildlife tourism venture you take critical investment decisions. I cannot stress enough how important it is for you to invest locally and to engage directly with and support local communities. Evidence shows that when locals have a stake in it they will be the best protectors of wildlife. I have just returned from Northern Kenya, the Northern Rangelands Trust, and they are doing amazing work with local communities to protect wildlife. Their mix of funding includes almost 30% of revenue coming from tourism. They are employing hundreds of local Kenyans. When I spoke with local people they told me the rhino and the elephant bring them security, health care and education and no one must interfere with these animals. They are the best protectors of the wildlife, working with local rangers, as their development is being achieved through conservation. The result – in this region elephant poaching is down by 50% and no rhino have been poached for four years – and tourism revenue is growing. And it is not the only example, with wonderful examples of success in many other places, including in the Chitwan National Park in Nepal. Many of these wildlife destinations are remote from capitals where there may be limited employment opportunities but this may open up opportunities for you. You can invest in local communities in a way that will benefit them, benefit wildlife and your business. You have the power to lift local people out of poverty in a manner that will be mutually beneficial and self-sustaining – whereas poaching only puts them into a poverty spiral. Or you can choose not to engage with local communities and to invest in a manner that sees all of the profits go off shore – in which case you are no better than the poachers and the smugglers. The reality is that you are not a fringe player in this fight – you are right at the center of it, you are there on the front line of this fight along with the customs and rangers and inspectors. How you engage with your staff, your customers and local communities, and where you choose to invest, can change the trajectory of the survival of our wildlife like no one else can - and you will be protecting the natural assets that underpin wildlife based tourism. You can be a key reason why we turn around the wildlife extinction crisis. You are not starting from scratch. People like Brett Tollman, who we just heard from, is already showing the way through the Treadright Foundation as are others. The future of wildlife is truly in our hands – and we here at CITES are ready and willing to work with you to help make sure our children are not standing on a podium in 2050 and talking of elephants, rhinos, lions, tigers, sharks or rays in the same way as we talk of dinosaurs and the Dodo. We can avoid this scenario but to do so we need you to join us in this fight.